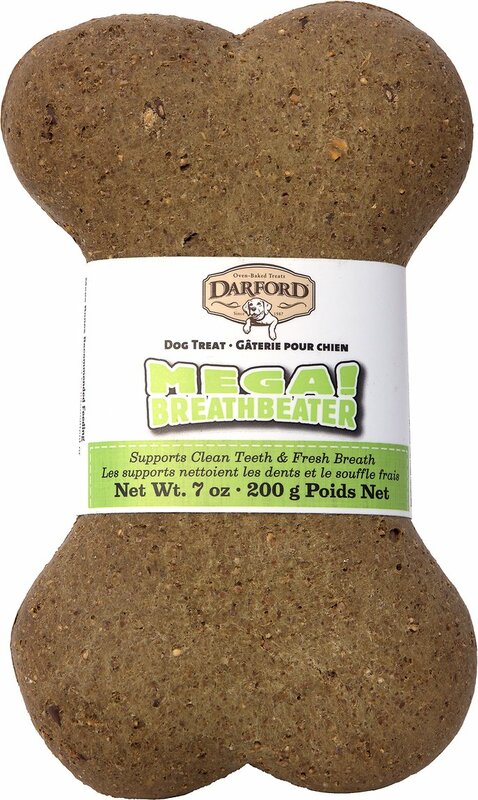 Darford Mega Breath Beater Bone Dog Treat gives your dog the scrumptious taste of peppermint and parsley in a crunchy, mega-sized bone. Deliciously minty, these treats are made with ingredients locally sourced in North America. Rich in antioxidants and vitamins, this recipe includes peppermint oil, parsley, flaxseed and wheat flour for palatability and nutritious benefits. The hard-baked texture ensures longer gnawing time, helping to clean your pup’s teeth as they crunch on this huge, healthy treat. Your dog is sure to go crazy for the mega flavor in this mega bone. Crunchy peppermint and parsley-flavored mega-bone is made and sourced in North America. 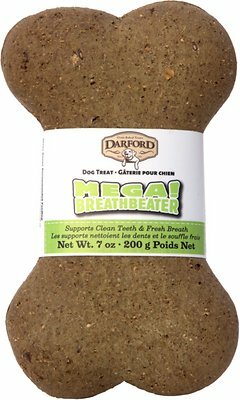 Hard-baked, this treat packs a mega crunch that cleans your pup’s teeth as he chews. Wheat flour is an excellent source of fiber, antioxidants, calcium, iron, selenium, manganese and magnesium. Peppermint oil and parsley not only help to freshen breath, but they aid in digestion too. Made without corn, soy or meat by-products. Just a natural, thoughtful and healthy recipe. 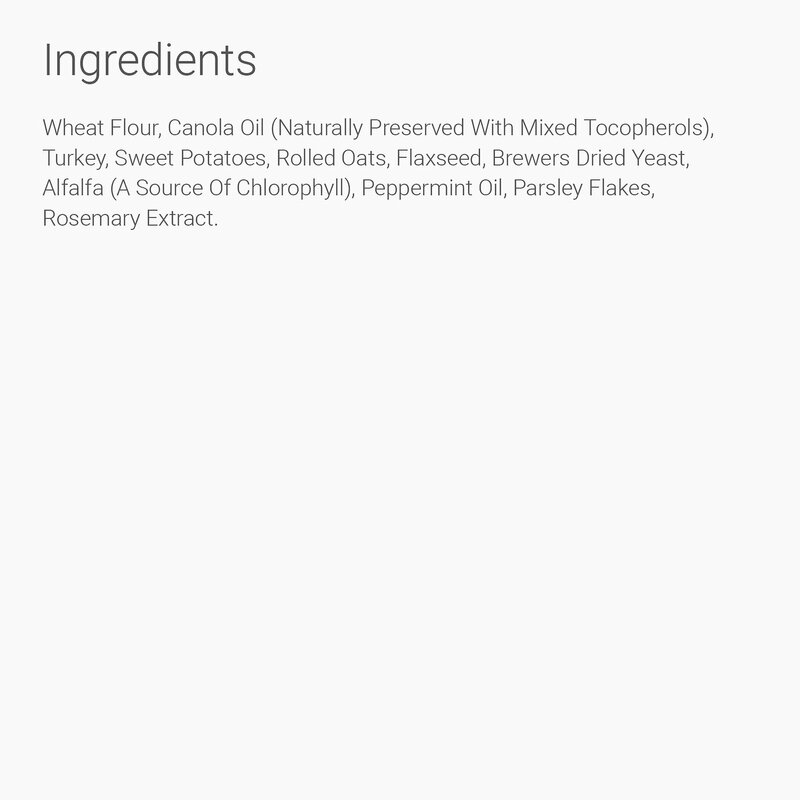 Wheat Flour, Canola Oil (Naturally Preserved with Mixed Tocopherols), Turkey, Sweet Potatoes, Rolled Oats, Flaxseed, Brewers Dried Yeast, Alfalfa (A Source of Chlorophyll), Peppermint Oil, Parsley Flakes, Rosemary Extract. This product is intended for intermittent or supplemental feeding only. Not suitable for small dogs or puppies. Each Mega Bone provides 50% of the daily energy requirements for a moderately active 75 lb dog. Reduce your dog’s daily food intake accordingly and always have fresh, clean water available. My Saint Bernard loved this BIG bone. It wasn't gone in seconds it lasted her a minute or so. It smelled good and wasn't messy like some bones are. Great if you have a big dog. My little dog loves this, but can't pick it up. I didn't realize the measurement for my chihuahua mix.--He's working on it. He just can't lift it or carry it. 6.5" x 4" FYI Next order I'm getting the 12 oz. bag of smaller bites. I would not recommended as treat or food. It doesn't say how long to store this product.